This monster is the cover card for Shining Victories. 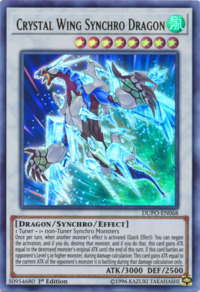 This monster is an evolution of Clear Wing Synchro Dragon. This is similar to how Shooting Star Dragon and Red Nova Dragon are evolutions of Stardust Dragon and Red Dragon Archfiend respectively, as hinted by their unique Synchro Material requirements. This is one of two evolutions of the Four Dimension Dragons that does not belong to Yuya Sakaki; the other being Greedy Venom Fusion Dragon. However, the first time this card was Summoned happened when Yugo synchronized with Yuya. Whilst Greedy Venom is summoned by Yuri on his own. This monster is the only Synchro evolution of the Four Dimension Dragons. After merging with his counterparts, it is unknown whether the evolutions are either lost or kept with Yuya. This card can be considered the Synchro counterpart to Dark Requiem Xyz Dragon and Greedy Venom Fusion Dragon as they all share similar traits, though the latter has a few distinctions. They are the evolved form of one of the Four Dimension Dragons. They are 1 Level/Rank higher than their respective Dimension Dragon. In the case of Greedy Venom, it is 2 Levels higher that its Dimension Dragon. They have 3000 ATK and 2500 DEF. In the case of Greedy Venom, it has 3300 ATK. They have effects that increase their ATK equal to an opponent's monster's ATK. In the case of Greedy Venom, it decreases its opponent's ATK. They all made their first appearance during a Duel with someone from the Fusion Dimension that took place in their corresponding dimension. Crystal Wing in Yugo's Duel against Celina in the Synchro Dimension. Dark Requiem in Yuya/Yuto's Duel against Aster Phoenix in the Xyz Dimension. Greedy Venom in Yuri's Duel against Aster Phoenix (w/ Kite Tenjo and Yugo) in the Fusion Dimension. They were created when Yuya entered a state of mind with one of his counterparts. Dark Requiem after getting possessed by Yuto. In the case of Greedy Venom, it is summoned by Yuri on his own (though Yuya was awakened at the time). They are Summoned using its corresponding base form and 1 card from the archetype it owner uses. Speedroid Red-Eyed Dice of the Speedroids for Crystal Wing. The Phantom Knights' Rank-Up-Magic Launch of The Phantom Knights for Dark Requiem. Predaplant Sarraceniant of the Predaplants for Greedy Venom via Super Polymerization. This monster has an Odd-Eyes counterpart: Odd-Eyes Wing Dragon.